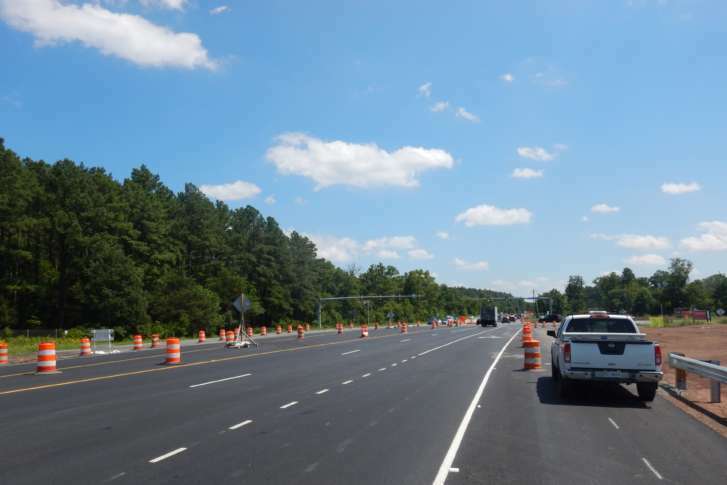 Virginia Route 606 is now widened to four lanes all the way from Evergreen Mills Road to the Dulles Greenway west of Dulles International Airport. WASHINGTON — A long-running project to widen a busy commuter route has been completed in Loudoun County, with Virginia Route 606 now widened to four lanes all the way from Evergreen Mills Road to the Dulles Greenway west of Dulles International Airport. A formal ribbon-cutting on the final piece of the 5-mile Old Ox Road widening, from two lanes to four lanes with a median, is planned for next week. The Virginia Department of Transportation hopes the wider road will help commuters to and from Ashburn, Sterling, Herndon and the airport. Up to 26,000 vehicles a day use the road, which can serve as an alternative to Route 28. The three-year, $119 million project included new traffic lights, a new intersection at and extension of Loudoun County Parkway to provide a complete connection between U.S. Route 50 and Virginia Route 7, two new bridges and a shared use path. The project was managed by the Virginia Department of Transportation with support from the Metropolitan Washington Airports Authority, Northern Virginia Transportation Authority and Loudoun County. Loudoun County is separately working with developers on a schedule for a related project to build Arcola Boulevard, which will run southwest from near where Loudoun County Parkway and Old Ox Road meet to Route 50 to provide another option in the area. Supervisor Matt Letourneau told constituents he hoped to have an update on that project soon. It is one of many missing links Loudoun County plans to get built in coming years.